In 1816 the Reverend Thomas Hutchings, a minister from Rhode Island, moved to South Carolina and purchased 307 acres in the Greenville District (now Greenville County). 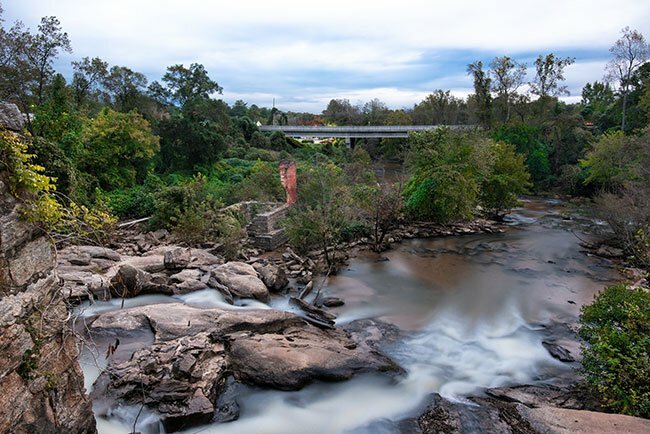 His goal was to build a mill based on the designs of those near his New England home, and soon after his land acquisition, a 144-spindle cotton mill – the first in Greenville District – was operating along the Enoree River. Mere months after the mill began operations, it suffered the first of three fires. Despite the mill’s initial success, Hutchings sold his business in 1827 to Philip C. Lester. Lester and his partner, Josiah Kilgore, are thought to have helped finance the rebuilding of the mill after the fire, which crippled Hutchings’ finances and forced him to sell. The mill was known during this time as Buena Vista Mill for the community of Buena Vista in which it operated, now called Pelham. Lester and Kilgore expanded Buena Vista Mill over the decades, producing $12,000 worth of cotton yarn in 1850. However, the mill once again burned in 1853, costing the owners exactly $12,000 in buildings and equipment. Lester bought out Kilgore after the fire and expanded the mill again, this time with fire insurance, and operated the mill with his sons. By 1860 a mill village had taken shape in Buena Vista, and the Lesters had added a paper mill to their operations, though it remains unclear if the mill operated on the same location as the cotton mill. The cotton mill continued to flourish during the Civil War due to an increased demand for yarn, and Buena Vista added grist and saw mills during the Reconstruction Era. Yet for reasons unknown, Buena Vista Mill never invested in modernized equipment, and without it the cotton mill could not maintain the production levels necessary to stay profitable. In 1880 the mill, then possessing up to 2,000 spindles, went bankrupt. The Pelham Manufacturing Company purchased the property at a public auction, which included 303 acres and all of its buildings. Pelham Manufacturing, or Pelham Mills, grew to include over 10,000 spindles by 1907. The factory also employed at least three children under the age of 12 during this era. Though the mill village included a school through sixth grade, many younger children worked with their families in the mill rather than attended school. The mill system forced many families to work tirelessly to pay their bills to the mill store, which was owned by mill owners and operators. Even still, most workers remained in a perpetual state of debt. Rather than a paycheck, mill workers were given envelopes which held an itemized list of expenses owed to the mill owners for their housing and personal staples, leaving very little in terms of actual payment. 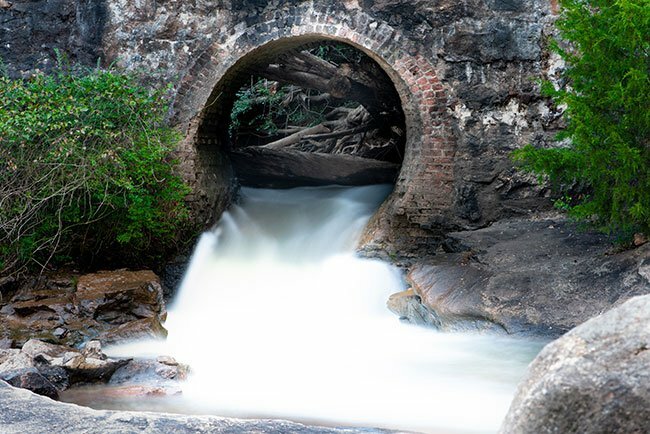 If there was payment after expenses were deducted, it was issued in the form of tokens that could be spent at the mill store. Many historians refer to the mill lifestyle as indentured servitude. In 1935 the mill closed, and the residential lots were sold along with the equipment. In 1940 a fire struck one of the mill buildings, in effect destroying what was left of the factory complex. 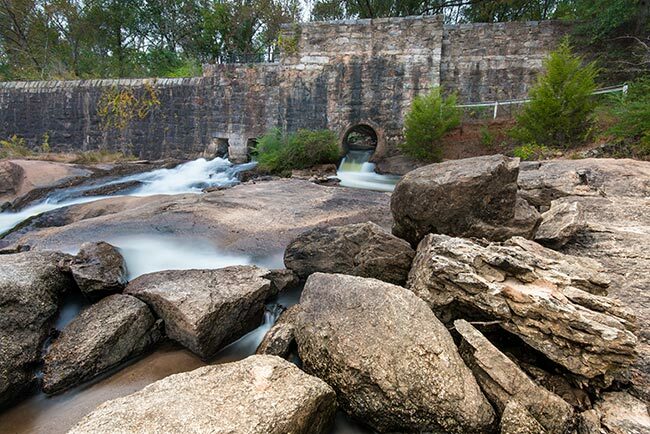 In 1979 the United States Shelter Corporation purchased the mill property and deeded 6.8 acres of it to the Greenville County Historic Preservation Commission. In turn, the Commission donated this property and a few more acres it had acquired to Greenville County in 1988. The county eventually acquired and added added seven more acres and converted the property, now part of Greer, into a park. (Buena Vista Factory; Hutchings Factory; Lester Factory) The archaeological significance of the site of the twentieth century Pelham Mills factory and its nineteenth century precedents is that this resource embodies physical evidence of the birth and growth of the piedmont textile industry, which has been one of the major shapers of South Carolina’s present economic, social, demographic, and landscape character. 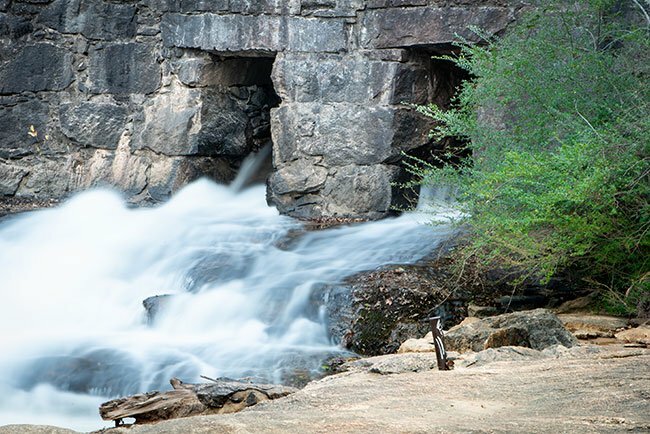 The ruins of Pelham Mills and its precedents are the remnants of a cotton factory which operated under several different owners from 1820 to 1935 on the Enoree River. 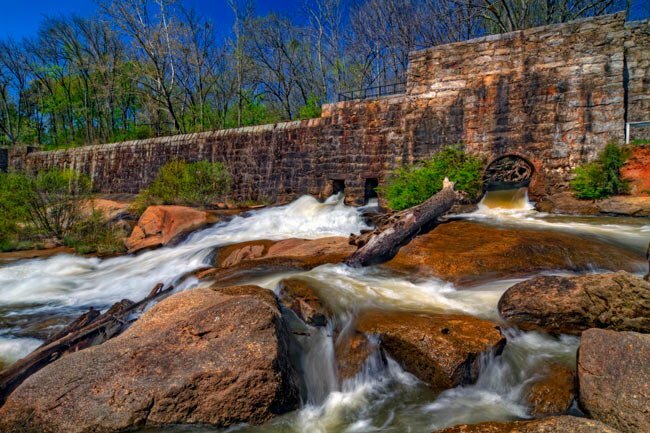 The ruins describe a complex series of stone and brick foundations which span a floodplain, rock shoals, and terrace overlooking the river. In addition to the foundations, which are both free-standing and incorporated into local landforms, the site includes the bases of two steam smokestacks and a number of ditches and depressions associated originally with underground pipes, drains, and turbines at the cotton factory; nine brick pilings which supported the water turbine-driven shaft(s) that powered the mill’s spinning machinery; the foundation enclosed turbine area and corner wall of the mill’s main powerhouse; a large, cement slab floor and vat associated with the mill’s main steam generator; a large mortared stone dam with six sluice gates, spanning the Enoree River; and a channelized stream with stone-reinforced sides. Nice place for a walk, but the trails look like they haven't been maintained. Would be nice to go further, but could not due to the trails not being maintained.